Taking care of my natural hair has made me so obsessed I often struggle with balancing my hair regimen with life’s demands like sleep, spending time with my loved ones, personal time, and work. And lately, I’ve been questioning my motivations for the extreme TLC I devote to my hair: Is all of this extra work simply a requirement for healthy hair? Or do I have a curl inferiority complex that makes me overcompensate when styling my tresses? Seven years ago I didn’t know what to make of the unwieldy strands on my head. I would simply douse my clean, wet hair with leave-in conditioner and braid it every night to stretch it out. The next morning my hair would be a small, undefined ‘fro that felt like the driest and brittlest of tumbleweed. I was so self-conscious the first time that I wore this style on a night out that I was convinced no guy would want to talk to me. Men kept hitting on my friends as I pretended to enjoy dancing on my own. As the night wound down, a guy approached me: “Don’t worry. I think you’re beautiful.” His eyes and tone did not agree with his words. My hair was twice this size a few hours before I took this picture. Sigh. 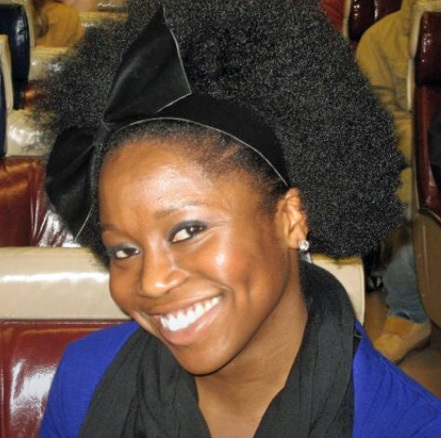 Soon I began to stretch and smooth out my kinks with a blow-dryer before I braided my hair, which added an extra 30 to 45 minutes to the styling process. This new halo of hair was my crowning glory and made me feel beautiful, similar to the way some women feel more feminine with long, flowing hair. I finally got a steady flow of compliments. But months of frying my strands proved to be too tiresome, as well as fruitless. The slightest change in humidity levels immediately obliterated any trace of my efforts. Since then, I can probably count on one hand the amount of times I have worn a wash-and-go in the seven years I’ve been natural. It took me a year-and-a-half to formulate a regimen that created a style that I loved, or should I say a style that I felt comfortable wearing because other people finally loved it? The twist-out is to Janday what the textured pompadour is to Janelle Monae. I achieve my signature look by adding a curl defining cream to my hair after every wash (which always follows the deep conditioning pre-wash treatment) and two-strand twisting it section by section. It takes me about 2 to 3 hours. The deluge of compliments began, the first time I ever wore my twist-out in public, with an emphatic “I LIKE THAT!” from an older man in line at Marshall’s. “You finally learned how to do your hair!” my cousin yelled when she saw me. The near constant positive feedback drowns out the negative opinions like the black female executive who once told members of my career prep program that natural hair is “unacceptable in the workplace”. Maybe my fixation on my hair comes from a desire to prove naysayers like her wrong. I am so focused on putting my best ‘fro forward that I have missed out on happy hours and dinners because my twists have not dried in time. My time-inefficient hair regimen cuts into prime cuddling time with my long distance boyfriend, and causes me to stagger, bleary-eyed, into work some mornings. And I keep reaching new extremes. When my boyfriend and I got back to our hotel the night of Coachella Day, my body shut down the moment I saw the bed. I woke up a few hours later, stumbled into the bathroom and was aghast at the mess of matted hair I saw in the mirror. Even at 5.a.m., my vanity gave me the strength to stand in that bathroom and twist my hair for an hour before going back to bed. As a self-described overthinker, I cannot help but wonder why most people praised my hair only after I started wearing a style with elongated and defined curls; a style that mimics hair with looser curl patterns. In a society where “ethnic” looks come second to the Eurocentric ideal, my very tight curls don’t measure up to the beauty standard for some people. I sometimes fear that I’m trying to tame my hair by using products that promise to “manage,” stretch, and transform my “dull, shrunken coils” (these words are lifted right off of the packaging). I wonder if I am forcing my strands to conform to a more socially acceptable curl pattern -– call it the politics of respectability for natural hair. 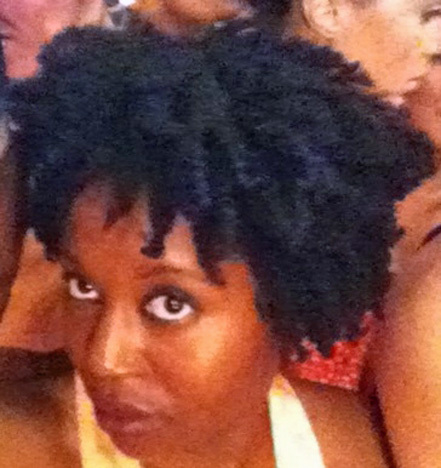 If more people celebrated my high-shrinkage, coily-coils would I be wearing a wash-and-go style right now? As frustrated as I get at times, I’ve accepted that an inordinate amount of time will always be spent on my hair because it is delicate. And I have committed to sacrificing some of my time so I can have a healthy mane, the way parents sacrifice the freedom of their adult lives when they have children. Yep, I just compared styling my hair to rearing children. The Bantu knots are on the left-hand side. I untwist them, and voila! Look at how my curls POP in the picture on the right. 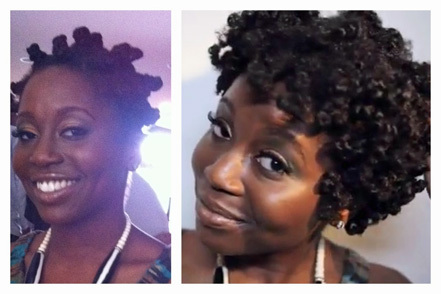 Since I love complicating things, I just added the Bantu knot twist-out to my regular styling regimen. There goes another hour of my time each week. Is anyone’shair wash n’ go? Or do most of us sacrifice some serious time to our hair?